This image shows the central mountains of Hale Crater on Mars, one for four locations on the planet where scientists confirmed today the existence of flowing saltwater rivers called recurring slope lineae (RSL). These active flows are seasonal and extend downhill from bedrock cliffs, mostly towards the northwest (lower right). 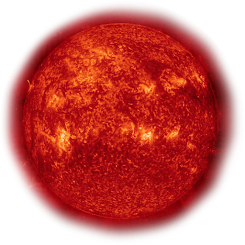 This image was acquired in middle summer when RSL are most active in the southern mid-latitudes. 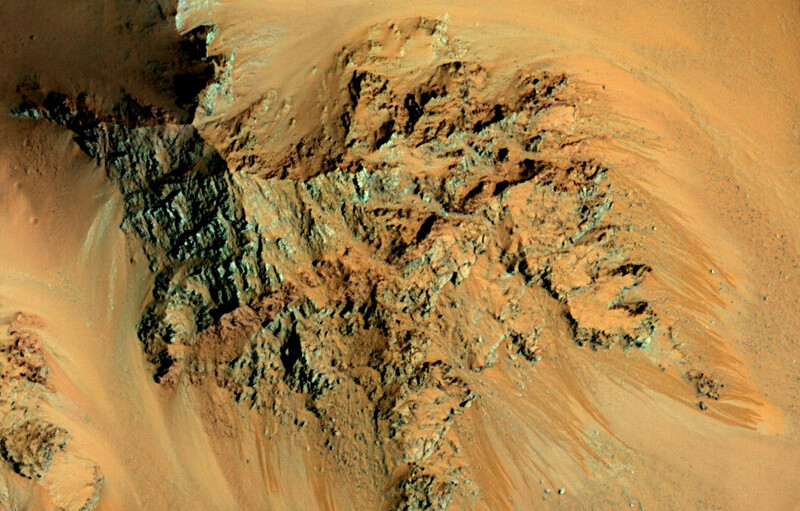 Image credit: NASA/JPL-Caltech/University of Arizona.New findings from NASA’s Mars Reconnaissance Orbiter (MRO) provide the strongest evidence yet that liquid water flows intermittently on present-day Mars. “We found the hydrated salts only when the seasonal features were widest, which suggests that either the dark streaks themselves or a process that forms them is the source of the hydration. In either case, the detection of hydrated salts on these slopes means that water plays a vital role in the formation of these streaks,” said Lujendra Ojha of the Georgia Institute of Technology (Georgia Tech) in Atlanta, lead author of a report on these findings published 28 September by Nature Geoscience. Dark narrow streaks called recurring slope lineae emanating out of the walls of Garni Crater on Mars. The dark streaks here are up to few hundred metres in length. 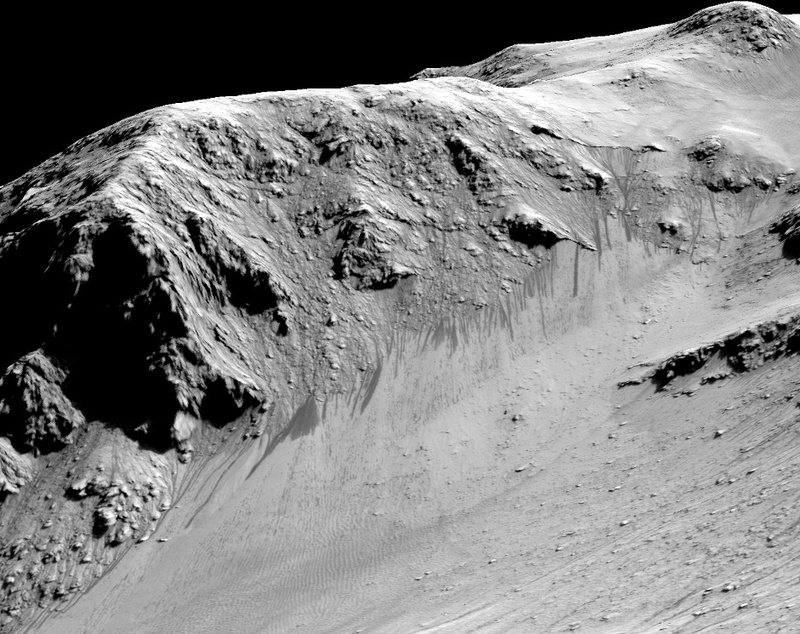 They are hypothesised to be formed by flow of briny liquid water on Mars. Image credit: NASA/JPL/University of Arizona.Ojha first noticed these puzzling features as a University of Arizona undergraduate student in 2010, using images from the MRO’s High Resolution Imaging Science Experiment (HiRISE). HiRISE observations now have documented RSL at dozens of sites on Mars. The new study pairs HiRISE observations with mineral mapping by MRO’s Compact Reconnaissance Imaging Spectrometer for Mars (CRISM). 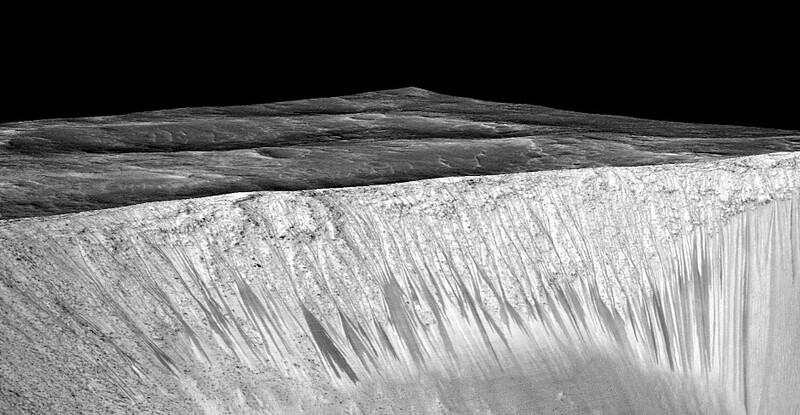 The dark, narrow streaks flowing downhill on Mars at sites such as this portion of Horowitz Crater are further examples of “recurring slope lineae”, or RS, inferred to be formed by seasonal flow of water on modern-day Mars. The streaks are roughly the length of a football field. The imaging and topographical information in this processed view come from the High Resolution Imaging Science Experiment (HiRISE) camera on NASA’s Mars Reconnaissance Orbiter. Image credit: NASA/JPL-Caltech/Univ. of Arizona.For Ojha, the new findings are more proof that the mysterious lines he first saw darkening Martian slopes five years ago are, indeed, present-day water.